Meet Heather Fay & Emily Reitenbach! Following The Style Loop on Facebook! 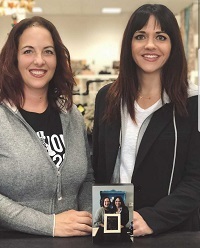 Inspired by small, local businesses, Heather and Emily opened The Style Loop in November of 2015. They wanted to offer Rocky River an upscale consignment boutique. They hand-pick and sell pre-owned women's high-end and contemporary clothing, shoes, handbags, and accessories. And, in September of 2018, their hard work paid off as they doubled the size of their store and celebrated a Grand Re-Opening in Beachcliff Market Square. The Style Loop ladies joined the Chamber in December 2015 after being advised by a close friend to do so. “Our friend worked in the nonprofit sector and shared that the Rocky River Chamber of Commerce is a great way to connect with the community and get our name out there,” said Heather. They stay connected with the Chamber through events and fellow members who are clients. “The best event by far is the annual Libations Tour. It's a fun and relaxed way to meet other business owners and support other members of the chamber,” Emily shared. Join Heather & Emily on the Libations Tour this year on Sept. 12th as they “tour” Rocky River’s finest establishments with 75+ fellow Chamber members. FUN FACT about Emily: She lives in Westlake with her husband Jeff, 13-year-old son Owen, and 10-year-old daughter Olivia. She also loves going to concerts, watching her son play basketball, and her daughter in gymnastics.